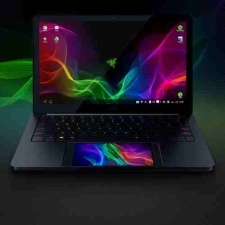 Laptop and smartphone manufacturer Razer is combining its technology to develop a new smartphone-powered Android laptop known as Project Linda. The new device is powered by the manufacturer's own Razer Phone, which slots into the chassis of the laptop where a trackpad would normally be. The phone itself is then used as the laptop trackpad, and is charged by the laptop's power bank. Project Linda comes with a 13.3-inch screen, 200GB of storage, USB ports, and a webcam, and is capable of running Android apps. It relies entirely on the 8GB RAM and Qualcomm Snapdragon 835 mobile processor within the Razer Phone to run. Users can also connect a mouse to the laptop, which frees up the connected phone to work as a second screen with different inputs. A video for the device showed Super Evil Megacorp's Vainglory being played on Project Linda, with the Razer Phone screen used to track the stats of players in the game. "Android power users and laptop enthusiasts share a need for performance in a mobile form factor, which we provide with our award-winning Razer Phone and Razer laptops," said Razer CEO Min-Liang Tan. "Project Linda combines the best of both worlds, bringing a larger screen and physical keyboard to the Android environment, enhancing the experience for gaming and productivity." Razer launched its Phone back in November 2017 for $699. Less than a month later, it formed a strategic partnership with Super Evil Megacorp to help grow mobile eSports.